FFPA managed to make it out to Penns Creek this past weekend and boy was it cold!! Can Mother Nature signal the start of spring already!? Ice was on the trees along the ridgetops all weekend long. Air temps barely got above freezing the entire time even along the banks of Penns. And there was ice on the guides when you spent too much time in the shade. Despite the cold air and water (40-42F) we did manage to get into some trout. Hot flies were big golden stones as the lead fly. Anything from your variegated stone (below, top), wired stone (below, bottom) or your traditional Kauffman stone. 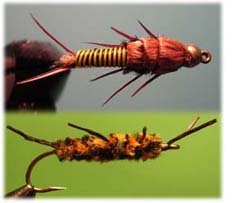 For the trailer fly it was one of our early season go-to Penns patterns - the little black stones. The rig above was fished under an indicator along with lots of lead! Though the water was high (1000cfs+ on the gage) the fish were found in the typical trout lies you find later in the season. You just had to put it on their head and really work for each and every fish. Also, all fish we landed except for one have yet to color up. 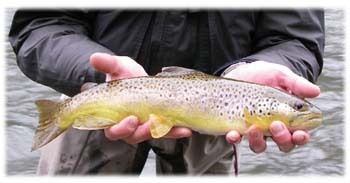 For instance the photo below in the March 26th post is a trout from last year. You can really see the color. And the fish had already, by late-March, started to pack on the weight. Definitely not the case this year. 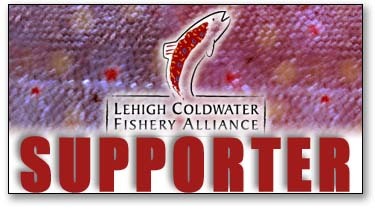 We hope to be on the water the next couple of weeks if Mother Nature cooperates. 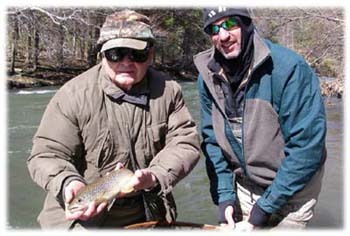 And no doubt the quality of the fishing at both destinations will be highly water dependent. First up is Penns Creek. She is running high. A lot higher than most would ever consider fishing it. However, she should be running that central PA limestoner green tint. As for the West Branch - - we still got a little way to go until it rounds into a preferrable level. Right now Hale Eddy just dropping thru 3,000cfs, which is fishable via the drift boat, but a little higher than we'd like. Hopefully the snow melt is on the slower side, and we don't get too much in the way of precip so that when we hit it, it is closer to 2,000cfs on the gage. 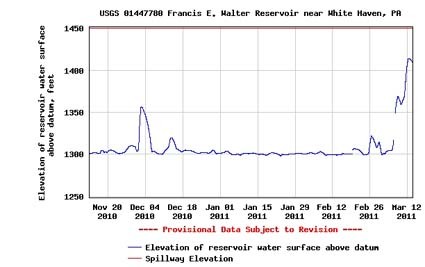 1,370' by May 1 is what the Fancis E Walter Flow Plan calls for. Right now the lake is sitting at over 1,400' Most likely the Corps will be dropping the reservoir to at or below 1,370' and more or less keeping it there till the start of the season. This would mean that outflow for the most part will equal inflow. The only wild card is if there is another large rain event predicted. If that would occur we will see the Corps purging. Remember, their main objective is flood control, and even a level of 1,320', however minimal it is, is an encroachment of their primary mission. For a frame of reference - - this event put Walter at 1,411' which is 50% of storage.